Atlas Pro Audio Questions About This Unit? Brand New - IGS S-Type 500 Series Mix Bus Compressor! Having two mono channels of compressor during tracking makes it very useful in the studio. You won't be just using it for mixdown. All the knobs are stepped (except for mix knob) making the settings repeatable, something you would expect to find only in a higher priced piece of gear. The mix knob is also a unique feature, allowing you to tweet your compression until it's just right. We don't think you will find a better priced or better quality stereo compressor in this price range. IGS has really outdone themselves on this one. IGS Dealer for North America! Compressor has attack, release, ratio, threshold, output, sidechain function, as well as unique Mixer knob which allows you to change the character of your compression. The switch marked London, BY, and New York controls your stereo, bypass, or stereo not-linked control, respectively. The S-TYPE 500 compressor is equipped with two sidechain circuit settings. London' (selectable with the LONDON BY NEW YORK switch) is a stereo mode. Two channels of the unit are being summed up and used to control both VCA stages. In'New York' mode only the left channel is being used to control both VCA stages. That allows you to use the S-TYPE 500 as a mono side-chain compressor where the signal at the left input controls the amount of the compression applied to the right channel. 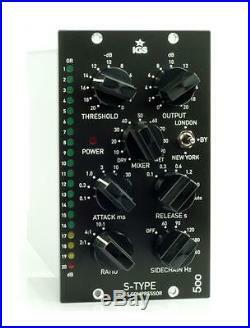 The S-Type is a typical VCA compressor well known as the core of the legendary British sound. The heart of the compressor is the THAT chip instead of the now unavailable DBX. The analogue path is balanced with ultra-fast op-amps. This is the source of completely transparent sound. A minimal level of noise allows the device to be used in recording classical music, including long range recording. The main new feature of the S-Type is the Sidechain HPF regulation. This allows the user to select the lowest frequencies which will not be compressed and more precisely control the bass and dynamics of the mix. Overall the S-Type is a very creative device. Great summing and mastering compressor. Beat compressor for external drum machines. Drum compressor for live drums. Can be used to compress single stereo instruments (pads, leads). The S-Type is a precision dynamic range controller intended for use in the most demanding professional audio applications. RMS detection, high headroom input circuits and output drivers, give the S-Type its own sonic excellence. Sidechain Filter: OFF, 60, 90, 120, 180, 240 Hz. Frequency response 5Hz to 20kHz; +/- 0.1dB. Power consumption 4.5 Watts. IGS makes excellent gear at affordable prices. A trusted name in the industry. At Atlas Pro Audio it is our priority to have great customer service. We are dealers for over 80 lines of the best high-end pro audio gear available. We can not, and will not falsify export documents. Upon request, we may require proof of identity and address, either passport ID or driver's license. Unauthorized reproduction is prohibited by law, subject to criminal prosecution. The item "IGS Audio S-Type Stereo Mix Bus Compressor (API 500 Series) + 2 Blank Panels" is in sale since Tuesday, June 16, 2015. This item is in the category "Musical Instruments & Gear\Pro Audio Equipment\Preamps & Channel Strips". The seller is "www-atlasproaudio-com" and is located in Brandon, Florida.